And so we turn to Patrol 13 of USS Michigan. Before we left, I knew it would be my last run on her. I was headed back to Virginia Beach and POSEIDON Fire Control School in the spring. On the 4th of October, I was in Port Townsend with a couple of friends, spending my last day of liberty seeing that beautiful city. There I saw the newspaper with the picture of the Soviet K-219 submarine on the front page. One of my friends asked me if anything like that could happen to us. Was I scared? “Of course not,” was my confident reply. To both questions. When I was very young, maybe seven or eight years old, I tried to plug in a lamp in the living room which had a frayed plug. In a massive display of sparks and shock, I took a rather bad burn to my wrist. I remember be terrified and shaking and begging Mom to take me to the Emergency Room. I was sure that electricity was killing me. Years later, in A School, I learned that electricity is a force for good, but that it requires respect, not fear. As we left Bangor on the afternoon of the 19th, we thought it would be just a regular patrol. No stops, no tests, no inspections. Just 80 or so days of boredom. Taking courage in hand, Dave shares a few of the best of his stories about the more… interesting times aboard USS Michigan SSBN-727. 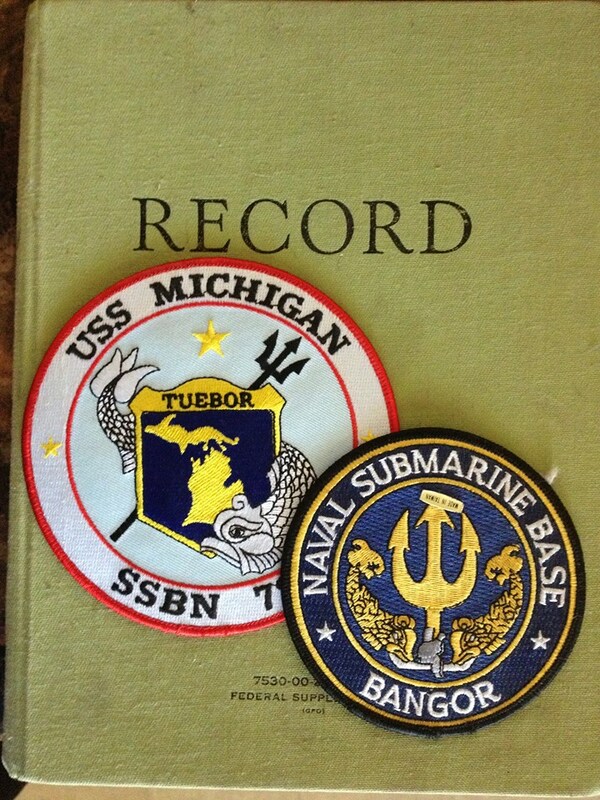 Over the course of six deterrent patrols, a lot of weird, funny and even gross stuff happens aboard an FBM Submarine. Most of it is harmless. Shoved in between all of that, is eating, sleeping, showering, working out, watching movies, reading books, listening to music and trying to figure out the best prank to pull. Most of which you will never ever hear about because, frankly, they’re only funny to submariners. There are drills galore. Division and Departmental Training. Throw in some General Military Training just for good measure. Once in a while there’s a stop in Pearl Harbor, or a Follow On Test that gets you back home in time for opening week of the MLB Season. Even – hopefully not as often – a problem that takes you home and lets you surprise the heck out of your friends who aren’t expecting you. It just goes on and on and on. Broken by the occasional special night, or maybe a FamilyGram that lets you know that there are people back home who at least for fifty words are thinking about you. It just goes on and on. Occasionally somebody gets hurt. Maybe they cut a thumb off or some such. But it goes on and on and on. Somewhere in Russia a nuclear reactor melts down and the Chief of the Watch wants you to take an atmosphere sample “just in case” we sucked in some zoomies while snorkeling a few minutes ago. And then it goes on and on and on. It’s a mistake. Just a simple printer misalignment. But for a few moments, maybe even seconds, you won’t know that. 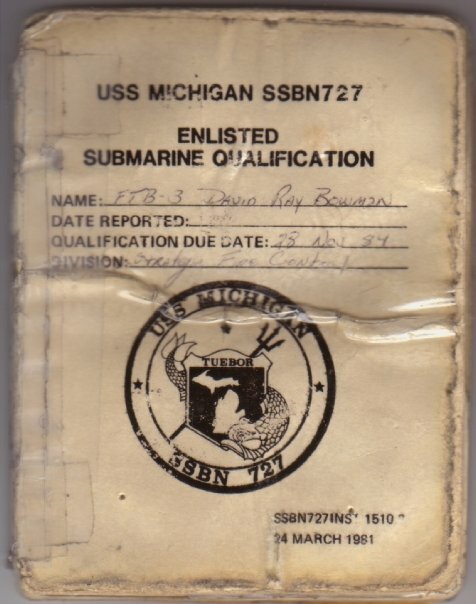 Part 4 – Dave begins his real Navy career with Patrol 3 of USS Michigan SSBN-727(G). After the Maneuvering Watch is secured, he begins roving the Missile Compartment and finds out just what happens when the ship dives while the potable water tanks are overflowing. Ships Quals take up most of the time, and when you aren’t standing watch you better be studying for them.